The south wall of Camden City Hall’s gray granite façade bears the uplifting inscription, “In a dream I saw a city invincible,” a reference to a line from this poem by Walt Whitman. Started on the cusp of the Great Depression in 1929, and completed two years later, that neoclassical house of government for the City and County of Camden still dominates the Camden skyline over eight decades later. Ironic, I know. Many have recounted and analyzed reasons for Camden’s long descent into its current despairing state. However, I have not come here to bash Camden, but to praise the Camden that was my hometown for my first 21 years. These Depression-era old postcard photos predate my memories of growing up in North and East Camden in the late 1940s through early 1970s, to be sure, but those experiences truly shaped the outcome of this baby-boomer’s life. 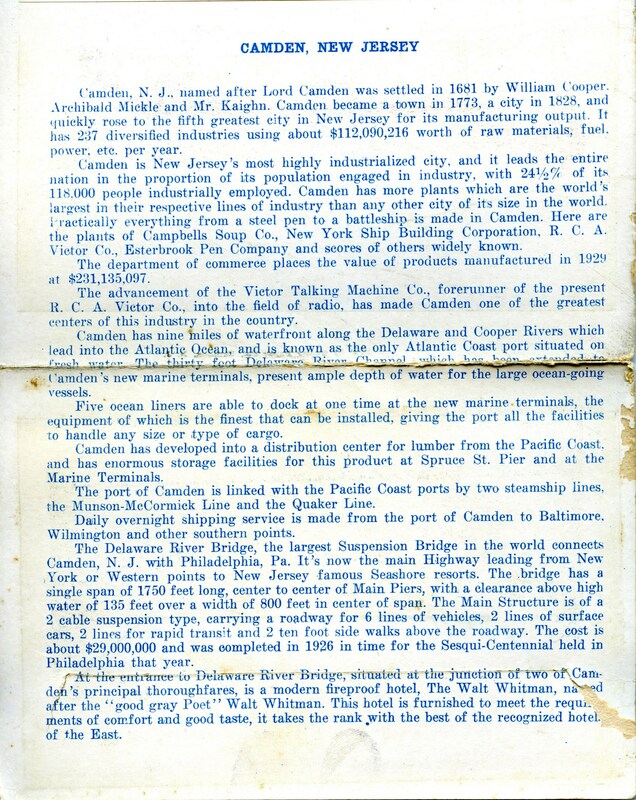 View at full screen all 22 Camden Souvenir Folder images in this PDF slide show (1.99MB). Obviously the Yacht Club, Train Station, Library, many old “mansions” on Bank Avenue, Riverton Park, Riverton Country Club ( Maybe include the bowling alley), old building at point of Main and Howard Street (love the architecture of it), Bank building on Main Street, War Memorial, Porch Club, Episcopal Church ( Stained-glass/interior). That is a start.